Snapshot of mart trade in selected marts across the country. Carnew Mart’s annual fatstock show and sale for bullocks and bulls took place last Saturday. Reports from the sale show an entry of 900 cattle on the day. There was a very strong selling trade with strong farmer, factory and export demand. The best beef bullock on show at 824kg made €2000. The Champion Bullock of the sale was a Belgian Blue Store Bullock weighing 684Kg and it made €1820. 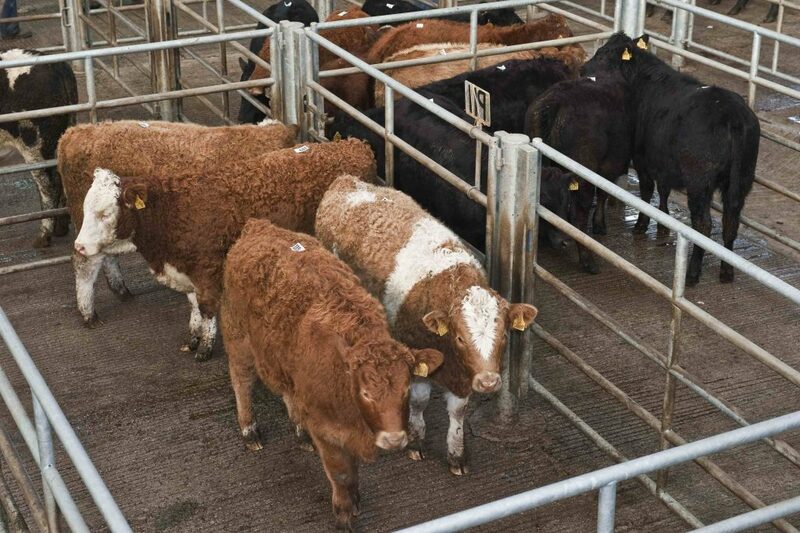 On the day the general run of beef cattle sold from €680 – €1200 over there weight. Store Bullocks were making €450 to €850 over the weight. Weanling bulls made €380 to €1000 with weight. In terms of calves Friesian bulls made €65 to €200 each. Continental Bulls made €190 to €460 and Continental Heifers made €150 to €410. At a sale in Ballybay on Saturday a good trade was seen with exporters in attendance . Sample prices on the day included; Ch 300kg bullocks were making €850 or €550 over the weight. A heavier CH 415kg made €990 or €575 over. A LM 555kg made €1190 or €635 over. A SIM beef bullock at 745kg made €1390 or €645 over. Sample prices for dairy stock included: FR 480kg made €580 or €100 over the weight. FR 260kg made €375 or €115 over. FR 730kg made €1100 or €370 over. On the Heifers side sample prices included: CH 280kg made €760 or €480 over the weight. LM 420kg made €1050 or €630. CH 570kg made €1255 or €685over. CH 630kg made €1270 or €640 over. Weanling prices included: LM BULL €775, LM HFR €680, BB BULL €650, AA HFR €470, SH X BULL €650, AA HFR €300. Dairy cow prices included: FR 2ND CALVER CALVED 2 DAYS made €1500, FR CALVED 3 DAYS made €1540. Sucklers cows: LM 2ND CALVER, IN CALF TO LM BULL €1060. Friesian bull caves made from €60 to €190. With very poor weather conditions Maam Cross thanked both farmers and buyers who braved the elements and showed at its last sale on Saturday. The weather impacted on numbers, with the small turnout trade was quiet brisk with a near full clearance at the Sale. Dry Cows ; averaged €1.25 per kg to €1.85 per kg. Highest price was €950 for a Dry Cow. Cows with calves at foot made on average €800 to €1,400. Heifers averaged €1.60 per kg to a maximum of €3.05 per kg with one heifer making €950. Weanlings averaged €1.60 per kg to a max of €3.20 per kg with €1000 being paid for a 360 kg Ch weanling. Across the border in Markethill in Armagh. Its latest sale reported an excellent entry of 360 store cattle, weanlings and sucklers on Saturday. A continued very firm trade was also reported. The 150 store heifers sold to a full ringside of buyers and included several pens of top quality lots. Good quality lightweights from £200 to £262 for 290kg at £760. Middleweights from£190 to £219 for 480kg at £1050. Forward heifers from £188 to £213 for 510kg at £1085. Second quality heifers continued to sell in a strong trade from £175 to £185 per 100 kilos. Angus heifers sold from £175 to £197 for 460kg at £910. 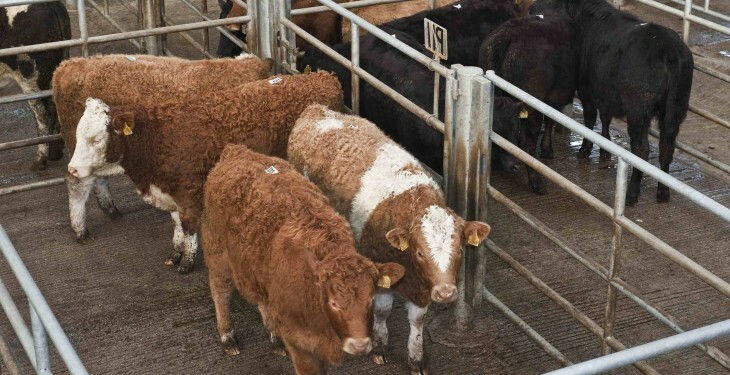 The 130 store bullocks sold in a very firm trade. Forward bullocks sold to £218 for 510kg at £1115. Main demand from £195 to £217 per 100 kilos. Middleweights from £190 to £224 for 430kg at £965 followed by £228 for 440kg at £980. Friesian bullocks sold from £130 to £155 for 420kg at £650. Angus bullocks to £193 for 580kg at £1120. Weanlings sold from £200 to £311 for 250kg at £790. Suckler outfits sold £1500 each. In-calf cows sold at £805, £800 and £780.